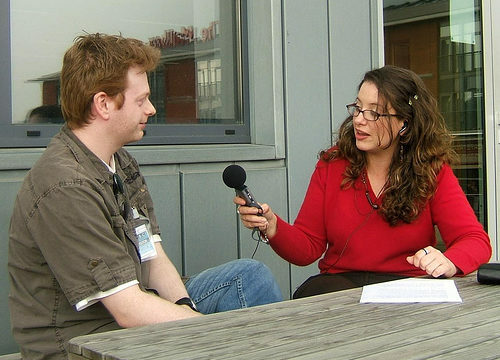 Understanding Secure Digital (SD) cards, the most popular external voice recorder storage memory cards, is not easy. Back in the old days, all we cared about was the form factor and storage capacity of floppy disks: physical size and how much you could store in them. But that’s changed. SD cards have so many features that will make your head spin. But here’s the secret to getting a grip of SD cards; purpose. How do you intend to use the SD card? SD cards have multiple purposes, they’re more than a storage media. And they have become ubiquitous, the default external storage media for all of our portable devices; phones, cameras, recorders etc. In this post though, we’re looking at SD cards for voice recorders. And the key features you should look for when choosing a microSD card for your audio recorder. 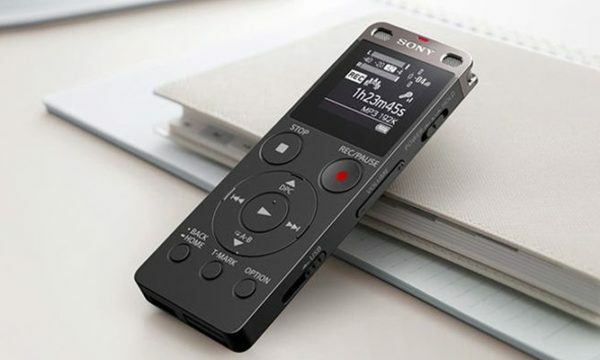 If you’re looking for recommendations, this is a great post on best sd card for audio recording, that has recommendations for the best microSD card for Zoom H1n, best microSD for the Sony ICD-ux560, and the best microSD for the Sony ICD-PX470. 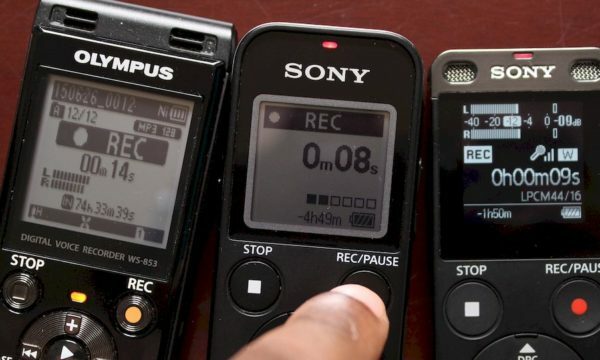 For voice recorders, you don’t need to pay attention to sequential (or random) read/write speeds, bus speeds etc of microSD cards; you don’t need to understand all the little symbols and numbers on an SD card – you can ignore most of them. However, if you’re looking for an SD card for your smart phone, digital camera etc, you’ll need to pay attention to them. What features, though, should you pay attention to when looking for a voice recorder SD Card? The three (3) key features you need to understand are form factor (physical size), file system (FAT versions), and capacity (determined by the manufacturer/SD specification). Let’s look at each one of the key features in detail. As previously stated form factor simply refers to the physical size of the card. 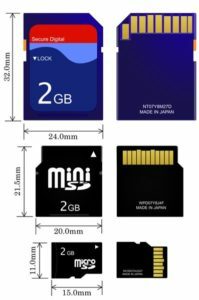 There are only 3 SD card form factors; standard, mini and micro. That’s it. I’ve yet to come across a recorder that supports anything but the micro form factor; the smallest size of the SD cards. (compare that to the 3.5 inch floppy); I’ve lost (misplaced) a few of them. So, do find somewhere safe to store them or always leave them in the recorder. You can easily identify a microSD from its small size or just look for the stylized microSD logo. You need a file system to manage and store data. Knowing where (and how) information is stored is vital in computing. If you don’t know where information is stored, you can’t find/retrieve it. Presently, all SD cards use variants of the File Allocation Table (FAT) file system. The SD specification defines what file system should be used for its 4 standards. Older SD cards used the FAT12 or the FAT16 file system. This is commonly known as the SD standard and was the first standard to be defined. 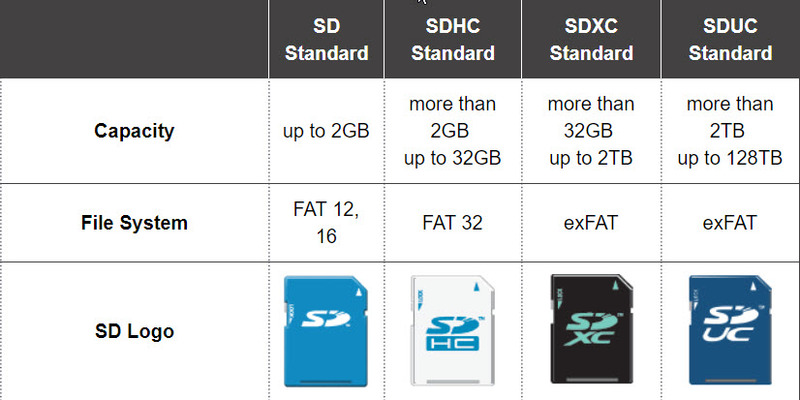 Then, came the SDHC (Secure Digital High Capacity) standard that uses the well supported FAT32 file system. And finally the SDXC (Secure Digital Extra Capacity) and SDUC (Secure Digital Ultra Capacity) standards that use the exFAT file system. SD card manufactures do not state the file system on their products. Instead, they state the SD standard. So, you are supposed to infer that a SD card labeled microSD uses the FAT12/16 file system. A microSDHC uses FAT32 file system and a microSDXC or microSDUC card uses exFAT file system. Conversely, voice recorder manufactures do not state the file system their devices support. They simply state the SD standard: microSD, microSDHC, microSDXC, or microSDUC. However, it’s important to note that the devices are backward compatible. Hence, a voice recorder that supports microSDHC cards, also supports microSD card. And a voice recorder that supports microSDXC also supports microSD, microSDHC. But you cannot use newer cards in hardware that only supports older formats. For instance, the Zoom H1n supports the microSDHC standard. Meaning that it uses the FAT32 file system and will not read/write a microSDXC, or microSDUC cards which use the exFAT file system. However, I bet the Sony ICD-ux560, which supports the microSDXC, will support microSDUC cards when they hit the market in 2019. That’s because both standards use the exFAT file system. Finally, SD cards (that use the FAT12/16 file system), are obsolete. You’ll be hard pressed to find a voice recorder that only supports the microSD standard. And we’ll probably see the first microSDUC cards in 2019. Most voice recorders support the microSDHC (FAT32 file system) or the microSDXC standard (exFAT file system). 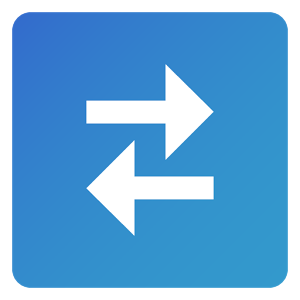 Again, it’s relatively easy to identify each stardard/file system – just look out for the stylized SD logo (see image below). It’s important to note that these are the SD specification limitations and not file system or even form factor limitations. That is, the FAT32 file system – SDHC standard – does support up to to 8TB capacity! And the exFAT up to 128PB (128petabytes)!!! Yes, these are theoretical limits, because crazy things start to happen when you try and create a storage device that large, but each SD standard can store more data than specified by the SD specification. There is nothing stopping you from having a 128GB microSDHC card. Well, except the SD specification. When I realized this, I formatted my Samsung Evo 64GB microSDXC card using the FAT32 file system. Why? As mentioned earlier, my Zoom H1n voice recorder supports microSDHC cards which use the FAT32 file system. However, the SD specifications limit microSDHC cards to meager 32GB. So no SD card manufacturer will make a microSDHC card larger than 32GB! Sad. And if you have read my Zoom H1n review, then you’ll know that I was really disappointed that I could not store more than 32GB worth of data. So formatting the Samsung Evo 64GB microSDXC, which uses the exFAT file system, to use the FAT32 file system I end up with a Samsung Evo 64GB microSDHC card. That doubled my storage capacity on my Zoom H1n and also made me regret buying a Samsung Evo 32GB microSDHC for the Zoom Hn1. If you want to know how I formatted my Samsung Evo 64GB microSDXC using FAT32 (it was not easy) let me know in the comments section below and I’ll write a detailed post. Here’s a detailed post, with video, on how to format and create a 64GB microSDHC card. To summarize, form factor, file system, and SD capacity are the only 3 features of a SD card that you should pay attention to when looking for an external voice recorder memory card. 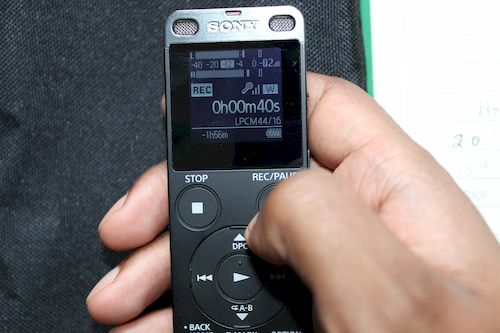 Most digital voice recorders support microSD cards. That’s the form factor you should look for. They are tiny, and not easily confused with the larger standard SD cards. Also microSD cards are usually sold with an adapter. Most voice recorders support the microSDHC or the microSDXC standard, that is, the FAT32 or the exFAT file systems. Please note that all voice recorders that support the exFAT file system (microSDXC standard), also support FAT32 file system (microSDHC standard). But voice recorders that support microSDHC cards do not support microSDXC cards. Backward, but not forward compatible. For specific recommendations, here’s a post on best microSD cards for your audio recorder. That’s it for this post. Hope you enjoyed it and was helpful in understanding external voice recorder memory or microSD cards. If you have any questions, comments, suggestions, please post them in the comment section below. I look forward to reading/answering them. As always, please keep us in mind for all of your academic transcription services needs. Hey Eddie, thanks for getting in touch. I recently wrote a detailed post on how to format those microSDXC. In that post I used a Samsung Evo microSDXC, but the same procedure will also work for SanDisks (I have formatted a 128GB microSDXC to microSDHC). Wasn’t sure my explanation of the formatting process was easy enough to follow…was planning to create a video next week.